Mill Creek at Harmon Meadow — Courtesy: Levin Management Corp. Brokers with Levin Management Corp. have taken over leasing and management at shopping centers in Secaucus and Flemington, the retail real estate services firm said. 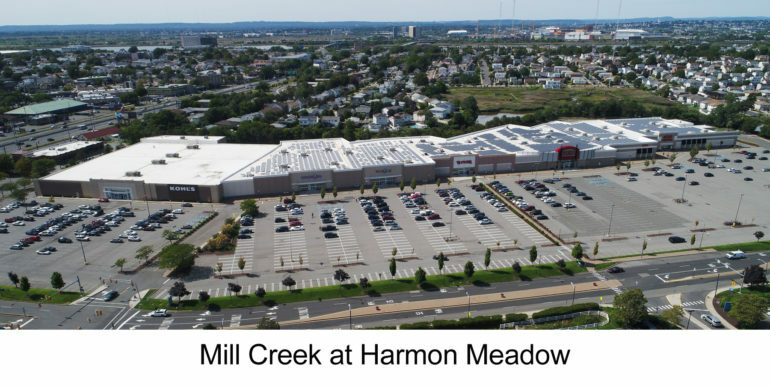 In Secaucus, LMC now oversees a 306,000-square-foot power center in the Mill Creek at Harmon Meadow development, with stores including Kohl’s, Babies R Us/Toys R Us, T.J. Maxx and Bob’s Discount Furniture. LMC Senior Leasing Representative Kyle Farley is heading up the property leasing team there, with its initial efforts focused on marketing a 47,260-square-foot big-box retail space formerly occupied by Sports Authority. The property recently was sold to an institutional client of New York Life Real Estate Investors. For LMC, it is the second Harmon Meadow assignment since the start of the year, following its appointment as managing agent for The Plaza at Harmon Meadow. In Hunterdon County, LMC took over leasing and marketing for Flemington Marketplace, a 240,000-square-foot open-air shopping center at the intersection of routes 202, 31 and 12. National anchor tenants include Kohl’s, Michaels and Burlington Coat Factory, which operate alongside Chili’s, Panera Bread and others. LMC also said a new Aldi supermarket is under construction and scheduled to open at the Flemington property this fall. “Flemington Marketplace has great presence, access and visibility, and is one of the best-positioned shopping centers in the Flemington retail district,” Lowry said. Under the direction of Senior Leasing Representative Andrea Kyriacou, LMC’s leasing efforts at Flemington Marketplace initially will focus on filling the center’s one remaining, 2,400-square-foot availability. The firm is also planning the creation of additional junior box space as well as a new outparcel.